You can’t tell the story of how it all began for supernatural cops Ivy Tamwood and Rachel Morgan without telling how it all nearly ended. The fiery living vampire and erstwhile earth witch never asked to be paired up in the first place. And having to work Inderland Security’s crummiest beat—busting two-bit paranormal street punks—sure didn’t sweeten the deal. But when it counts, Ivy and Rachel always have each other’s backs. They’d better—because someone just hung targets on both of them. It doesn’t take a hotshot homicide detective to know that nearly getting flattened by a falling gargoyle or impaled by a lead pipe aren’t on-the-job accidents. But it doesn’t seem possible that the class of crooks Ivy and Rachel routinely collar could kill anything but brain cells. So who put Cincinnati’s tough and tender twosome on their “to do in” list? Is Ivy’s vampire master, the powerful and seductive Piscary, jealous of her growing bloodlust (and just plain lust) for Rachel? Or have forces unknown—living or undead—made the partners prey in a deadly witch (and vampire) hunt? Before this case is cracked, Ivy and Rachel will face down vicious dogs, speeding locomotives, rogue bloodsuckers, and their own dark desires; spells will be cast and blood will be spilled; and Kim Harrison’s hair-raising, heart-racing, dark urban world of magic and monsters will leap howling from the pages of her second electrifying, full-color graphic novel. Soooo cannot wait for this one either! Loved the first graphic novel! Looking forward to this continuation of Ivy and Rachel prior to the Hollows series! Since word has spread that contractor Mel Turner can communicate with the spirits of the dead, it's been difficult to maintain a low profile. She embraces her new reputation, however, for the chance to restore an historic house in San Francisco's Castro District. The new owners, who hope to run a haunted B&B, want Mel to encourage the ghosts that supposedly roam the halls to enhance the paranormal charm. The catch: Mel has to spend one night in the house to win the project. But during the spine-chilling sleepover, the estate gains another spectral inhabitant—when someone doesn't survive the night. And as Mel tries to coax the resident spirits into revealing the identity of the killer, she risks becoming the next casualty of this dangerous renovation. Looking forward to this one too! 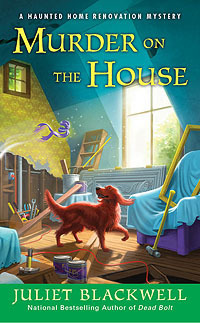 I may be wayyy behind on my 2012 releases, but Juliet Blackwell writes some of the best paranormal mysteries ever! Both of these sound tempting...thanks for sharing. As always you astound me with the variety of what you pick. Love Kim Harrison and have never read Juliet Blackwell. Please check out my WoW. Nice picks... These sounds pretty good. 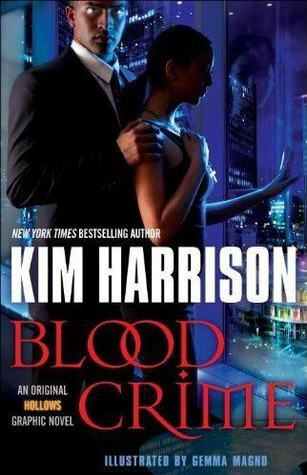 Cover for Blood Crime is intersting, hope the story is as good. Hmmm...I haven't heard of these but they sound interesting. Especially the first one. Thanks so much for passing by my blog! Kim Harrison is sooo fun. I didn't know she had a new title coming out already :) Excellent choice! I've never read a graphic novel not sure if I would like them. Or Does The Hidden by Kelley Armstrong count? lol I do love The Hollow series. You know what is crazy I still have not read the last book. I just got so behind. murder on the house looks really good. it's been a while since i read a cozy mystery. my WoW pick of the week. Great book picks! Blood Crime looks awesome! I really like the cover too! Mysterious and intense....my kind of book! Thanks for sharing and stopping by My WoW post! Murder on the House looks cute! I love fun paranormal mysteries! Thanks for stopping by! Nice Robert de Niro. Love both of the books, especially the second one sounds good!! Thanks for stopping by and I hope you have a great week! Fun picks! Gotta love mysteries :-) Thanks for stopping by! I still haven't read the first Hollows GN yet. Need to pick it up before the next one releases. Great pick! I enjoy Kim Harrison but haven't read anything by Juliet Blackwell. Hope you enjoy them when you get them. Ooooh you had me a supernatural cops! Both books sound great! Hope you get the soon! I'm always in for more Kim Harrison and I love the synopsis for Murder on the House. Nice picks! They sound great. Thanks for stopping by. Happy reading and thanks for stopping by my WOW!! Great picks this week! Thanks for stopping by! I haven't heard of either of those books, Jess! Thanks for sharing and stopping by! Kendare Blake & Lisa Desrochers Signing! OMG, how AWESOME is this?